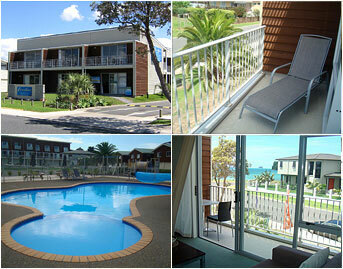 Beachside Resort Whitianga offers lovely one bedroom self-contained apartments at competitive rates. All are individually furnished with contemporary décor and offer queen size bed some units with a fold out couch for two children sleeping in the same bed. Each apartment has a modern fully equipped kitchen with a microwave, fridge/freezer, ceramic hob, hair dryer, iron and ironing board. Most bathrooms contain a shower over bath, with the exception of our accessibility units which have a shower only. Some units have a spa bath. The living area is open plan and you will find a CD and DVD player and a television with Sky TV available. First floor units have a good sized balcony furnished with outdoor settings. Most apartments have a view of the water from the lounge room. There is off street parking and you are just a three minute stroll to Whitianga’s main street, not to mention only 1min to the beautiful Buffalo Beach. Fall asleep to the serene sounds of the ocean – perfect for a romantic getaway!